#  This script automatically displays a message bust instead of a face. #  Put in script list below Materials and above Main. #  graphic used in the message, plus the position of the face in it. #  then you will name the bust image "Actor1-1.png"
#  NOTE: This script does NOT contain bust images. You will need your own. #                           # call will change until changed again. #                           # false = on left. true = on right and flipped. # will make the bust appear below the message window. # by the bust image width IF the BUST_Z is 0 or more. SLIDE = true         # Slide portrait onto the screen instead of fading in. @bust = Sprite.new if @bust.nil? Hello. I have a problem with the script and I would like you to help me with it. Script “Galv’s Message Busts” line 112: NoMethodError ocurred. I don’t know about scripting, so I don’t know how to fix it. Thank you and sorry if my English is not good. It occurs when I’m going to talk to someone. I mean, when a message box appears. I started a new game to test. Try copying the script again. Make sure you put it below Materials and above Main in the list. The only other thing I can think of is you have another script conflicting with it. I have a problem copying your script into my project , I end up copying the Line Code Number..
Hello. I know this might be off topic, but I was wondering how you can make where you start a battle and your face graphic would show during battle. I’m not sure what you are asking here, but you can show messages using the Troop Event or even just use show picture. Like when they enter the battle each character has their face graphic showing. Hey, is it possible for the bust to be centered in the middle, in addition to left and right as already implemented? Well, can the bust be put in the right/left without mirroring it? I’m sorry, I don’t know what you mean. What do you want to do? I mean mine is always on the top, I can’t move my actor in the side of the screen..It’s always blocking the way when I talk to someone.. I still don’t know what you want to happen. The bust will appear where you set it to appear in the script. It’s meant to appear above things, I don’t know what you mean “blocking the way”. If it’s covering your player is on screen then you could change your map or make your busts smaller. I’m really sorry, I still don’t understand what you are asking. Download the demo and try to see for yourself what the difference between it and whatever is happening with yours is. I have a quick question, how come when I call a common event, it cancels all of my future bust images? Is there anyway to fix this? I’m not sure what you mean by ‘future bust images’ or what you mean by it cancelling them. But the script has a switch that controls if the bust images work or not – are you using that switch in your eventing? Have a play with the script settings to see what they do. If it says you are unable to find the file then you might have named your bust images incorrectly. See the demo for examples of correct naming or posting your exact error message might help me help you easier. Telling me more specific errors is helpful. All I can do is guess what you’ve done here. Thank you! It worked ^^ But the problem now is that when I put the show picture it doesn’t show at the bottom of the screen (http://i.imgur.com/7RseuNQ.png) even though I set the ‘BUST_Y_OVER = true’ and BUST_Z = 10. Also after I leave the conversation the picture doesn’t leave! >__< (http://i.imgur.com/jH9gsEw.png) I seriously need to practice more with the scripts, events, and etc. OTL Sorry to trouble again! Sorry to be a bother but I was wondering if there’s a way to use this for multiple busts? As in, I have three busts of the same character with varying expressions and would like to switch between them during dialog. Except, I can only assign one bust per-character in a character sheet. (Basically, I’d like to use multiple busts for one single character) I could just make extra copies of the character sheet and relabel the busts accordingly, but that’s a bit tedious and takes up extra space in the files. (>.< ) So I'm wondering if there's another way or if you've implemented this in the script and I've missed it. :) Thank you! I am not sure I understand what you are asking, but busts are drawn in relation to the face-set chosen for the message window. You’ll need a face set position for each bust, that’s how this script works. Sorry, I figured it out. Just made some multiples of the facesets. For some reason, I got the impression that busts were registered to the character sprite sheets, not the facesets! It’s all good now, sorry for the confusion! How much work would be involved in defaulting to a face rather than a bust if a bust wasn’t there? I am also willing to pay for this work. – I am using busts for major characters, none for minor characters. I have not seen that error message before. Yes, this script does work with yanfly’s message system, make sure to put this one after yanfly’s in the list. Make sure to start a new game. Galv, is there any way for me to put the busts behind Choice Boxes? I’ve tried using your Visual Novel Choices script and the bust still covers up the Choices. That just makes it look strange. Do you think there’s a way to move choice boxes (the default ones) to the left side of the screen instead of the right? Because I really need the character faces on the right side. Galv, i am using your script with Ace message system, if i put the bust at the bottom right and at a higher Z than the message box (which is the configuration i am planning to use), the message doesn’t recognizes the mirrored bust at the bottom right and just goes behind it with no offset. Is there a way to align the text to the left and offset it at the right WHEN the bust mirror is set to true and at the bottom? I don’t know what you mean. Is this script below yanfly’s script? Sry for the delay Galv (Sometimes i forgot you’re very fast to answer you blog hehe). Yes your script is below Yanfly’s message. Actually your script is making the correct offset when the message is at the bottom and the bust is also in the bottom and to the left,with a positive Z value. What happened in my case is that i am using Killozapit Word Wrapping script (http://www.rpgmakervxace.net/topic/6964-word-wrapping-message-boxes/), and this script doesnt recognizes the bust to the right, only the end of the line to automatically jump lines. I think my best bet is to ask killozapit if he’s in the mood to make it recognize your script, when it comes to mirrored busts =). Thanks for the answer Galv. By the way Galv, do you know if this script is compatible with Modern Algebra’s ATS: text formatting script? The busts sit at the edge of the screen, you could modify your bust image if you wanted that changed. The patch script to add if using Yanfly’s victory aftermath is in a spoiler in that post you linked to. Thanks for responding, it worked after I did as you said. Unfortunately now I have another error, after doing what you said I inserted Yami Script Ace – Overlay Mapping trying both before and after the two other scripts, now the character busts won’t show. Any idea? Or do you know of another Parralax mapping script that won’t do this? One other question, I want the bust to appear on the right side without being flipped how do I do that? Which line/lines of script do I have to change, and how? Yes, make sure your scripts don’t use the same switches/variables. But unfortunally there’s a space with your actual script and I didn’t see any option in the setting to move down the bust (nameplate included with it). I am using your other script, Message Background. Your tip worked but the bust was behind the dialog box with the default settings. No worry, I’m already happy with the custom dialog box script you made. Hey, really kool script here really! But I have some little..(maybe HUGE ones for me) problems. Okay, I know nothing about scripting so I just copied the whole stuff and paste it, and things worked just fine for me. Until one moment that the script strangely stopped working, while I didn’t use any other scripts until this moment. Strangely, the scripts worked for first events of my project, but not for the rest of the project. Can you tell me what’s wrong? In the script settings you specify a switch that can disable the script. I am guessing you are activating that switch. Maybe I unintentionally switched it up. Can you tell me how I might ‘accidentally’ turned it on and how to turn it off back? Hey, i’ve just found the cause why the script didn’t work, it has something to do with my event’s conditional branch and the switch activating it. How I can make the script work while I can maintain the event’s conditional branching and the switch activating it? Lately, when I playtest my game, it crashes. It stopped working (except for BGM, strangely). It always happens after a cutscene plays and the actors are transferred to the designated place, and bam! The game’s stop working. Currently I use your bust script and Yanfly Ace Messaging System…well I’m planning to use your menu layout script too. Perhaps this have something to do with the scripts? Or not? Can’t tell without knowing the error and what was being done when the error happens. I’m having a problem with the script as well. I had set one of my actors to only use a portrait instead of a bust and called the script command “DISABLE_SWITCH = 1” right before the dialogue was displayed. But whenever I playtest, the game stops and gives an error asking for the bust of the actor. Is there a way to fix this? As in, using faceset in normal and switching to bust whenever we switch on the event id? Sorry, I don’t follow. It’s just a switch on or off ? Galv, it’s working fine on my first and second map, but why on my different maps it doesn’t work? ‘Doesn’t work’ doesn’t help me help you fix your problem. I assume you mean it reverts back to the normal faces in the messages? If so, did you read the settings? I copy the full thing but apparently it doesnt change anything. I put it between Materials and Main Process, but when I try to play the game it says that there is an error. Apparetly i have to do something with a switch, but I have no idea of what a switch is in scrips, or how to change them. Also how i use the demo? I download and its an .exe but I also dont know what it does when I use it. Should I put it in an special place or something? Like in the rpg files? I do apologise I don’t have time to teach people individually. Best ask in an rpgmaker forum and I recommend when asking for help with an error, include what the error message says. The demo is a project made in rpgmaker, it installs the new project so you can see the script working. It probably doesn’t matter anymore since it’s been 3 months, but maybe it helps others. You need to set up a switch in line 39. Change the number to the number of the switch you wish to use. In your switch list you should assign a new one for this, name it to remember and don’t use it for something different in an event. In the script editor you can’t tell switches apart by their name and you cannot look into the list from there, so memorize the number and put it there. Great script, however I noticed a small gfx hickup when you alternate between busts and dim, faceless backgrounds. In your demo I added some text with no face, dim background and position middle to the event of the guy on the right, right between the wait action and the last text action. The effect is that it looks like the following bust fades in twice. Just a small hickup, but I have no idea how to solve it. I thought I tried that allready, but I must have made a mistake somewhere. It works! Awesome! I need this in my project. Of couse I’ll give credit. Hi there! I’ve been using your system, and it works great! I was just wondering; is there anyway to get multiple busts on the screen at once? Like, instead of having them switch every time a new character is talking back and forth, they can both just be on the screen at once? Thanks! Not in the script. You could use “show picture”. Script ‘GalvsMessageBusts’ line 164: SyntaxError occured. Any thoughts on what I need to do? Thanks much! Or try copying script from the demo as some people’s browsers add characters that aren’t meant to be there when copying. Ahh it is, too. I haven’t updated the demo. I will do so when I have time. Great, thank you for the prompt response. I was wondering, as I mentioned in my earlier posting, is there a download link to just a text version of the latest version? Thanks much! Apart from the code on this page, no. I just dunno why random people’s browsers add characters that break it when they copy. I cannot replicate their issues – perhaps they use some kind of plugin I don’t have that causes it. Thank you so much for your awesome script. It has saved me so much time. I have a question though. I turned the ‘slide’ function on, and it will indeed slide the first bust in a conversation in, but all the rest will be static. Is this how it is intended to work? (ie. just the first bust in a convo will slide, the rest will not move). If this is how you meant for it to work, is there a way to make all busts slide? If this isnt how you meant for it to work I am doing something wrong hah. Thank you, sir. I will try that out tomorrow. Hi Galv, just wanted to say that your script is working great for me. I do have a question though. Right now what I’m doing when I have a face set is paste them into the Face and Pictures folder and renaming the Pictures facesets to “Name-1” and clicking the left tile for the face image of the event. I was wondering if there was a better way to do it without having to rename each image one by one? It gets kind of taxing with multiple emotions and several characters. Oh and although it is my first post here. I want to thank you for being responsive to all the users. Galv i know this might be a stupid question how do you add characters and what do i do after that? I don’t know what you mean by add characters. There is a link at the top of the page to a demo for you to look at to see it working. Hi! We’re interested in use your script in our game, but we also use Ace Core Engine and Ace Battle Engine for Yanfly, and with this the game crash when a battle begin, there is a solution for that problem? Thanks for all! Put the script below yanfly’s scripts. Start a new test game. Might be a very stupid question but i can not find the demo on how to use this, for some reason i just can not figure it out. Sorry but I don’t know why the bust shows only in one map in my game. When I go to another map, when someone talks, the bust is disabled, I don’t know what to do. Sorry my english isn’t very good…. Oh, also, thank you for this great script, it’s really useful, but it seems that I don’t know how to use it, haha. Ah, yes! Problem solved, thanks. Aparently, I was trying to do that, but not in the correct event. Then I realized a thing and it worked, thanks! Hello, Galv. Thank you for making this amazing script. I do have a question, however. When the bust is above the message window, the text in the window does not appear, but when the bust is under the window, everything is fine. Is there some way I can fix this? I’m not certain what you mean. Try the generic list, could be script conflict. I have checked, and there doesn’t seem to be a solution there. I am on a new game, I have messed with nothing, and this is the only script I have. When I place the bust over the message window on the left hand side, the bust does show up, but the text does not appear. When I have the bust over the message window on the right side, or underneath the message window, the text will appear. I apologize for double posting, but I have found the solution. It had to do with the bust itself, not the graphic. Thank you for your time, and the wonderful script! Ugh, I mean the bust itself, not the script. Sorry! Is there a way to use default faces inside message boxes for some? Like something I can type inside the textbox to just show a normal face? This refers to the in-game switch number you would turn on using “Control Switches” to make it use normal faces. Hello Galv, I have a question. Is it possible to make it so the character portrait stays while a new one (on the oposite side) appears? To say it simplier, to have more than one of the portraits on the screen. Simply setting it so two appear on oposite sides don’t work. Hello sir. i have a problem. First of all the script works.. but when a cut scene occurs it disables the bust and it only shows the graphics.. So I started using this script, only to find that the first bust of the game kinda flickers. It’s pretty irritating, and unprofessional looking, so how can I fix it? Unfortunately “kinda flickers” is not enough information for me to help you. Not sure why it’s happening for you, but I recommend trying out another bust script. when I try talking to someone,a box says “Unable to find file in Graphics/Faces” :/ could you help me plz? You need to make or get your own bust images and call them the correct name as described in the instructions and you can download the demo for example. Hey thanks for making this! I don’t use script often enough to be able to figure something like this out so thanks a lot. Also a quick question. I haven’t done this before but I have seen in some games animations with the bust, from just mouth moving or the character blinking, and I was wondering would that just be saving a gif for the image or would I have to use script and somehow type out the command? 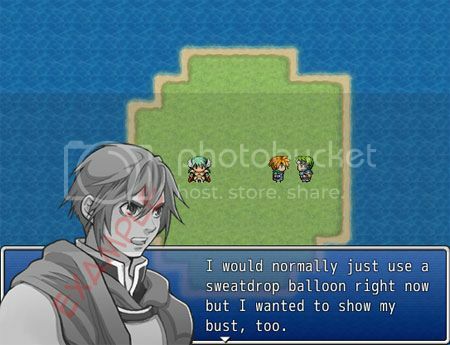 Unfortunately rpgmaker doesn’t support gifs. That functionality would required modifying this script to get to work, it currently cannot do it directly. Boo, oh well. But thanks, it is a great script and I would have to take years to get something even close to this! I’m having some issue trying to use the demo?? Whenever I extra the file from the ZIP file and I try to load the application, I get a pop-up saying “Windows cannot access the specified device, path or file. You may not have the appropriate permissions at access the item.” and then my computer promptly deletes the file thinking it is harmful. This is my first time attempting to use a script and it might just be something I’m doing wrong but I’m not sure what it is? It sounds like you have a virus scanner that is falsely picking up the file as harmful. Unfortunately I cannot help with virus scanner issues. How large do the busts have to be in order for them to work or do the sizes not matter? Is there a way of making the textbox and bust appear at the bottom and have the bust wrapped in front of the text box? Can this be added into the lite version of RPG Maker Ace? If so, it says you can’t edit scripts. I’m so confused. No, you need to be able to use the script editor and I believe Lite does not have that feature enabled. Yes, you are turning the switch on that disables the script… see the settings. That explains a lot. Do I just put a 0 to turn it off? . 3 . How can i make it so that the face of the current assign face of an actor shows up as a bust. I want to change my actor graphic and I want all his previous message busts to change to the new actor’s bust. and i forgot to say one more thing. Thanks for letting me download the script. Just out of curiousity, the program puts the bust automatically on the right hand side and flipped. How do i flip it back over to the left side of the message board? Hi, Galv. I’m unsure if this is my own doing or not, but lately in dialogue when going back to a bust that was previously shown, it flashes the image before fading it in. Any idea why that is? It only seems to happen sometimes, and I fixed it before but have no idea how. When it comes back the second time it flashes before fading in. I should have tried what you said before replying. Adding 5-10 frames before the bust re-appears seems to iron out that issue. Thanks so much! Script ‘Galv’s Message Busts V1.1’ line 167: NoMethodError occurred. I found a way to replicate the error (if that’s helpful at all); I created two common events set to parallel process, with the same condition switch. The first common event has Wait: 1 frame(s) followed with Show Text (no bust) and the second common event simply has Show Text (with a bust). Whenever a turn ON the conditional switch (which I just created, so it’s not tied to anything else) the game crashes immediately, every time. I might be able to solve the problem using Wait commands (and probably stop player movement commands), but I thought I would message you first, just in case there’s an easier solution. Thanks again for the awesome script! Ahh I see – never thought about multiple messages activating at the same time. I think using wait would work for now as I don’t have much time to do fixes yet. Working on trying to do more, though, so one day this will be fixed. I completely understand; between school and my job, I don’t have much time either. I’ll leave a comment if/when I find a solution, and I’ll keep checking this board just in case you figure it out before me. :) Thanks for the quick reply! I found a… well, sort of a solution. Part of line 167 uses “@bust.bitmap.width” and this is apparently what’s causing the error. I’m a pretty novice scripter, so I couldn’t figure out how to tell it to set this to 0 if @bust was nil (or… whatever I should have told it to do lol). However, I lucked out: all of my busts have a width of 272, so I was able to simply replace “@bust.bitmap.width” with “272”. I was expecting this to cause some undesirable spacing in the non-bust message during these rare multiple message conflicts… surprisingly, this doesn’t seem to be the case. I’m not really sure why. It suggests that the game still recognizes the difference between the bust and the non-bust messages, which leaves me confused as to why the original error comes up at all. Anyways, I thought I’d share my rough fix, just in case it could help you find a more permanent solution later. For now, my error seems to be resolved, and your script is a beautiful addition to my game. :) Thanks again! It pops up right away when I playtest. Is there something I’m doing wrong? This error also pops up whenever I try to put any number after BUST_Z. I put the script between main and materials. I’m not sure what I’m doing wrong at this point? Thank you in advance. Yes, it appears you are doing multiple things wrong. The error you are getting says on line 85, which refers to incorrect code that doesn’t even appear in my script. Did you accidentally overwrite another part of your script code somewhere? Hey there Galv! I Love what you have here, I’m just wondering if it is possible to implement a feature which allows a guy to have 2 busts out at once, as in, one character says something, then stays after the dialogue box disappears, then a mirrored bust opens with a new dialogue, then once that box is gone, both busts vanish. Sorry, not with this plugin. This plugin was designed to use the face from the Show Text message box (which you can only have one). Script ” line 70: NameError occurred. Try copying the script again. Sounds like it didn’t copy over right. If copying from this site doesn’t work, get it from the demo. Make sure you put it in the right place in the script manager. I tried making my own bust using the ones your demo uses for reference (exact same pixel size and filetype). Now I have saved them into the mentioned img/picture folder under the name “Actor.png”. First problem: Just saving it to the img/picture folder leaves me unable to select the bust when writing the show-text event. So I also saved it to the img/faces folder under the same name. Hey galv, i hope you are still answering some questions, i have a bust looking at the left side, and i want to flip it but the bust mirror moves the bust, is there a way to flip it without moving the bust? Not in this plugin, sorry. It was only set up to be left and normal or right and flipped. You could modify your bust image to face the other way. Ok thank you for answering my question, i’ll do my best to change it, its just that im so tired, thanks again….. Oh! I have a question, how do i move the bust left or right after flipping it, is it possible? Or is bot then how do i put the bust in the center? Not with this plugin, no. If you can’t see a script call for it, the plugin doesn’t do it. The sentence is awkward because I used Google Translator. Thank you for your understanding. If you use the “\ BST [7, Actor2]” command instead of the usual display method to output the picture, SCG displays the picture immediately without animation. This makes the game look less complete. How can I put animations when displaying SCG with commands? I don’t know what SCG is and this script does not use the command \BST [7, Actor2]. Are you asking this in the right place? Sorry. I chose the wrong kind. I wanted to say RPG MV version “GALV_MessageBusts.js”. “SCG” stands for Standing CG. Please post on the correct plugin/script – it’d help me out a lot. The MV version \BST[x] is to change the bust mid message and is not designed to slide in and out, sorry. I don’t plan to change that. What’s the recommended size for the busts in pixels?